Until now. Meet the new GT3-R.
We knew the moment it was unveiled that the 2016 Continental GT3-R wasn’t exactly normal, for a Bentley at least. This is supercar performance through and through, folks. Coming from a Bentley? For real? Yes and yes. 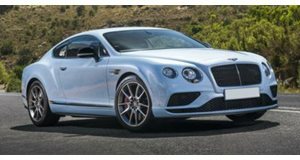 The GT3-R bears its name from the GT3 race car, and it’s been declared as the fastest-ever accelerating road car Bentley has ever made. How fast? It has a claimed 0-60 mph time of 3.6 seconds, but Motor Trend, in its first official test drive, managed to do that in just 3.3. With its 4.0-liter twin-turbo V8 pumping out 572 hp and 516 lb-ft of torque, it’s also 220 lbs. lighter than the GT V8 S. Essentially, it’s a grand tourer disguised as a race car that has the potential to cause trouble. Seriously, its exhaust was loud enough to get the MT crew in trouble at the track.